Project Status Report How to Write Status Report? How to Write Status Report? What is a Status Report? Would you know a high-quality project status report if you saw one? Don’t worry; most people wouldn’t. And that really is a shame because in today’s fast-paced world of modern business, there’s no better way of delivering crucial data to stakeholders than a well-crafted project status report. After all, the key to making good business decisions is having the right information. And comprehensive project status reporting gives you just that: clear, actionable figures to inform future decisions. How to Create an Impactful Project Status Report? This in-depth guide will take you through how to craft a quality project status report, some of the essential KPIs involved, and we’ll also include a few tips and free templates to help you out along the way. How to structure status reporting? Comprehensive project status reporting is crucial to a project’s overall success – that much is clear. But how are you supposed to deliver such information? What elements should you include to ensure full understanding? How should a project status report be structured? Should the information be granular or more of an overview? The answers to all of these questions will depend on the overarching goals, individual stakeholders, and specific details of your individual project. But more often than not, following this simple outline of which elements to include will more than suffice in most situations. Begin your project status report with a short executive summary that provides a high-level explanation of the information contained in the report. Any recent achievements or missed milestones. This section is included specifically for upper-level management and executives and, for many, is as far they’ll get in the report. It’s meant to help them decide if they already have the information they need or if they should keep reading the full report for further details. As such, including this information is absolutely crucial when there are high-level decision-makers involved. While the summary provides a quick overview of the progress of the project, a detailed look at the KPIs is the meat of the project status report. These aspects are instrumental in determining if the project is developing as expected or if actions need to be taken to get it back on course. Once again, these factors can vary wildly depending on the particular project but, in general, there are a few KPIs that are useful to have in every report as we’ll discuss later. While it’s critical to have a KPI section devoted to the numerous performance indicators that determine the success of a project, it’s also important to devote more time and space to two specific KPIs: budget and schedule. These two metrics are often the primary concern for higher-level decision-makers. 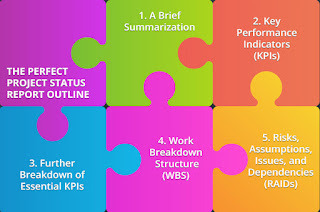 Work breakdown structure section is devoted to communicating what was achieved since the last report, as well as which tasks are still left unfinished. The detail for each of these tasks will shift depending on the audience of the report but typically you’ll want to at least include which tasks were completed and which still have yet to be finished. Each RAID (usually only the 2 to 3 most important items) should include several additional pieces of information: the person responsible for the item, its overall impact on the project, and its status (WIP, open, or closed). Since one of the primary components of any project status report is the KPI reporting, it might be helpful to have an idea of which metrics should be included. By far one of the most important KPIs, the schedule is typically the first thing on the mind of key decision-makers and should never be left out of the equation. Many times, this particular metric is the deciding factor on the overall success of a project. Depending on the project, it may even end up being more important than whether it’s on schedule. Scope is another important aspect to consider when assessing the status of a project. If efforts are moving outside of the project’s initial scope (scope creep), it’ll likely require a reassessment of many aspects of the project. This section helps to inform project stakeholders about any potential problems that may occur throughout the life of the project, as well as what is being done to mitigate or prevent them entirely. 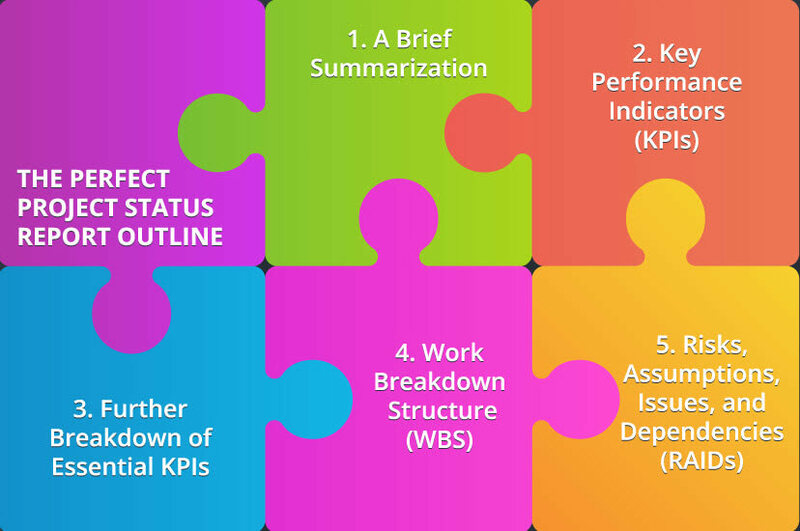 This KPI helps to communicate steps that need to be taken in order for the project to proceed as planned. They are integral in setting immediate goals and forming plans of action. Don’t be afraid to tailor your KPIs to your project’s specific needs though. The most effective project status report is one that communicates not just any data, but relevant data. While you’ll typically want to include each of the above metrics in your project status report, it’s also a good idea to spend a bit more time on two of these KPIs in particular: budget and schedule. Why is it almost always a good idea to single out these two factors? Because they are oftentimes the most indicative of future success. When key stakeholders need to make a decision on whether to pour more resources into a project, let it continue as is, or scrap it entirely, two of the first aspects they look at are if it’s meeting the original timeline and if it’s using an appropriate amount of capital. As such, effective project status reporting depends on your ability to communicate these two trends in particular, both clearly and efficiently. Should be broken down into 4 to 5 phases maximum and should each include a start date, end date, completion progress (%), and overall status. It may also be beneficial to include individual milestones within each. Should, at its most basic, include at least the forecasted budget and the actual expenditures. More detailed reporting might give a percentage (or dollar value) variance between the two or break down costs into separate categories (i.e. resource costs, software costs, etc.). 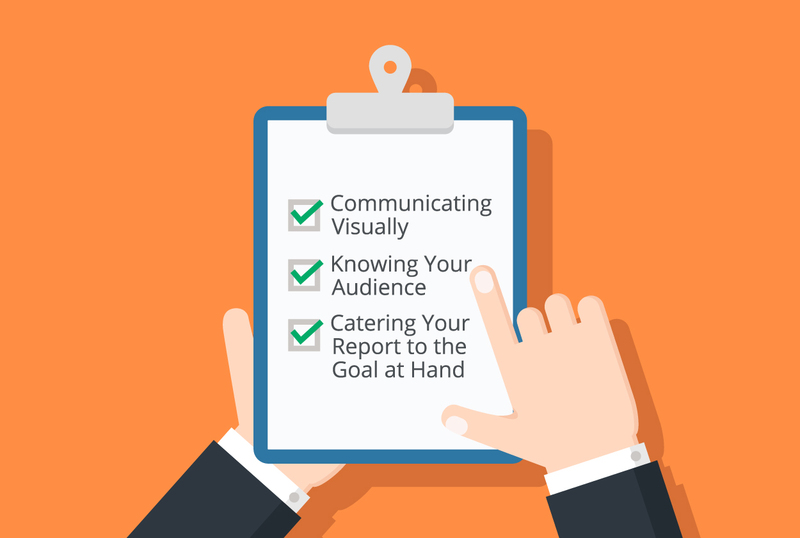 While you now have everything you need to create a comprehensive project status report, there are a few more strategies to take into consideration before you finalize your report. Though not as quantifiable as the components above, keeping these tips in mind will help ensure the information you’re delivering is both understood and appreciated. Project status reporting is meant to be clean and informative. But that doesn’t mean it has to lack visual appeal. In fact, adding color and (some) creativity can actually help communicate ideas more effectively. Using, for instance, a “stoplight status system” to highlight problems in red, risks in yellow, and successes in green can turn a block of hard-to-decipher data into an easy-to-skim update. One of the most important aspects of impactful project status reporting is that it is relevant to the stakeholder it’s presented to. If, for instance, it’s meant for very high-level executives and CEOs, you’ll likely want to keep the information general with more of an overview of the project rather than the granular data you might pass onto a direct supervisor. Packing your report with too much information may actually confuse your audience and muddle the true impact of the data you’re presenting. And lastly, be sure choose the specific KPIs and additional data that best communicate the specific goal your audience is interested in. A resource manager, for example, will likely be less concerned with the “quality” of the development than whether the project is on track with the budget. Now that you know what it takes to create an impactful status report that not only communicates all the necessary information but also does so in as efficient a manner as possible, it’s time to find the templates to match. The project status report templates byTechno-PM are the smartest and easiest way to standardize your project management workflow. These free templates include project status reports specifically designed for Excel, Word, and PowerPoint. They also cater specifically to certain management goals and styles like team status reporting and agile project status reporting. So be sure to check out and download Project Status Report Templates by Techno-PM, and start streamlining your project management today.